Yesterday was a rough day, thanks to work and myriad other things going on. When dinnertime rolled around, we decided to just hit California Pizza Kitchen with the kids. When we first got there, Owen was being all grumpy-like and the girls were kind of hyper. I was feeling overwhelmed. Then Cate said, “Let’s play I Spy!” Honestly, my brain couldn’t handle it. I kept thinking about my to-do list, I wasn’t feeling well, I just didn’t have the energy. But Nate jumped in and proceeded to play a guessing game with the girls all throughout dinner. I sat there, watching their excitement with the game, listening to their sweet comments, gazing at their innocent, beautiful faces. It was like a healing balm. I felt grateful…grateful for Nate, grateful for those cute kids. Gratitude. That is what I’m focusing on this week. 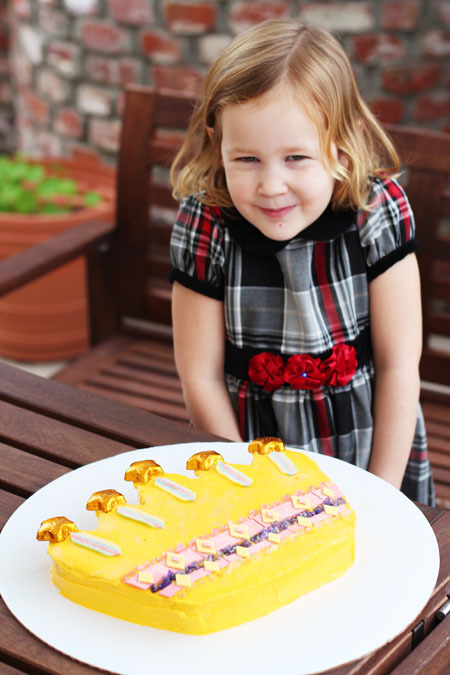 Gratitude for a 5-year-old daughter who wanted a crown birthday cake. Gratitude that I had the chance to make it for her. Gratitude for the work that provides us a place to live, even if it gets stressful sometimes. Gratitude for each moment I get to spend with my loved ones. I’ll survive the week. I may or may not get everything done that I’m supposed to, but that’s okay. I am grateful. 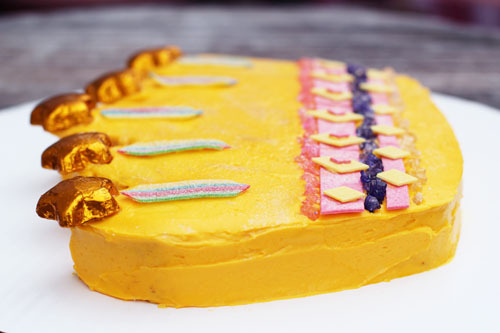 Cute Cake and your so lucky to have a great hubby that hopped in and played along. thanks, and you’re right, I am lucky to have nate! AMEN!! I have had so many of these moments since Friday – just catching myself watching my children and being so very thankful for them and their safety and their health. Amen again. “catching myself” is the perfect phrase….all week I keep doing that. taking a breath. focusing on what matters! Thank you, Jane! Gratitude really is the best medicine when feeling overwhelmed. I’ve been feeling overwhelmed lately, too, so I needed this timely reminder. You’re a fantastic Mom and blogger. You’re a star. Merry Christmas! “I’ll survive the week. I may or may not get everything done that I’m supposed to, but that’s okay. I am grateful.” I needed these words. Thank you. Happy Holidays! so glad I wrote this then, megan. I almost didn’t, but you know, this is our life this week, so here’s the post. glad to know I”m not alone ! 🙂 happy holidays! We definitely get why you feel grateful for your nice husband and cute kids, it is so important to put on those gratitude glasses and try to see how blessed we are, it is just too easy not to wear them. We love you little story and we hope you will check out our newly started initiative , which encourages people to share their ”ª#storiesofgratitude”¬”¬”¬.